Teide National Park is the biggest park on the Canary Islands. A trip that should be at the top of the must-see list of everyone who visits Tenerife. A unique landscape of craters, volcanoes and rivers of petrified lava, surrounding the impressive silhouette of Teide Volcano that stands at 3,718 m above sea level. There are many services organised for visitors so that they can discover and enjoy this area: a convenient road network across the entire Park, two visitor centres that reveal some of the park’s secrets, a bar and restaurant area for refreshment, abundant vantage points to gain a panoramic view of the whole park, an extensive network of trails for visitors who want to discover more of the park and even two types of accommodation, Las Cañadas del Teide Parador Hotel and Altavista Refuge, which is located at an altitude of 3,270 metres. Teide National Park is one of the great wonders of the world, with the advantage of being easy to get to and relatively close to European countries. The entire Mount Teide National Park is a unique geological treasure in which the volcanoes, craters, vents, lava flows and different materials, form an impressive array of shapes and colours. You will be surprised by the diversity of Las Cañadas del Teide, taken aback by its huge rivers of petrified lava and impressed by the eroded rocks and colossal dimensions of this mineral chaos. In contrast, in spring you will be delighted by the wonderful flowers and gentle aromas, unique in the world. Mount Teide dominates the landscape of Teide National Park. This imposing volcanic edifice looks quite different depending on your exact location and the actual season. Its changing looks are a never-ceasing source of delight for onlookers. At its feet lies a sea of volcanic rocks that formed so recently that erosion has not had time to wear them away, and they offer a wide-ranging catalogue of volcanic forms and materials contained in the great amphitheatre defined by Las Cañadas escarpment. The wall surrounding it extends across 25 km, reaching heights of up to 600 m in the area known as Guajara, its highest point. This natural cut affects what was a former volcanic edifice, which partly disappeared 198,000 years ago, when the current Las Cañadas depression was formed by a giant landslide that uncovered some of its roots in Los Roques area, revealing conduits and volcanic vents that fed past eruptions. Teide National Park, located in the centre of the island of Tenerife, is the largest and oldest of the four national parks on the Canary Islands. From its surface area of 190 km2 (18,990 hectares), Mount Teide rises up to a height of 3,718 m, which makes it the highest peak in Spain. It was declared a National Park in 1954 and in 1989 it was awarded the top category of the European Diploma of Protected Areas. It has two visitor centres, one in Portillo and the other in the Parador Nacional Hotel. The centres are focused on nature and traditional uses of Las Cañadas, respectively. In 2007, Teide National Park was declared a World Heritage Site by UNESCO. 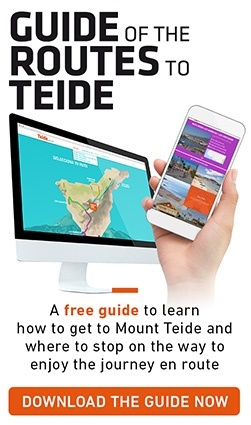 Browse our catalogue of tours and activities and select your exclusive Teide National Park tour!